Want to be notified of new releases in postman721/Calculator? Features include all the basic calculator features. Hint. 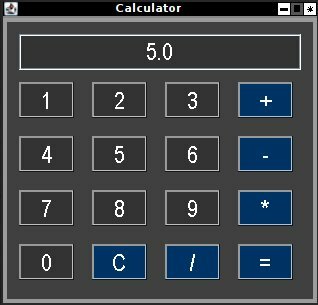 To input something like 5.0 to the calculator, click the text-field and type 5.0 using the keyboard´s numeric keys and the dot key. By default, Calculator returns results in the form of x.y(for example, 2.0). Press number, like 5 then press +,-,* or / and press another number, like 5. Next press = sign to get the result. If you want to do a longer calculation do it like this: 5 * 5 = * 10. Press 5 and then * and then 5. Now press = to get the result.After the result, continue calculations. If you do 5 * 5 * 5 the result will be 25 and not 125 like it should be. To overcome the issue, use the steps outlined above and get a result of 5*5 first and then continue multiplying the numbers further. Keypress functionality for division, multiply, plus and minus keyboard keys. You can type the numbers to the text-field and press buttons with the mouse. Numbers are accepted from the keyboard when the text-field is selected(clicked). The keys lacking support, as mentioned above, will be integrated in the future releases. dist folder has the .jar file. --> the executable you want to run. src folder has project sources. nbproject folder has all the Netbeans project files. The program need Java JRE 1.8 or equivalent to run. Linux: openjdk-8-jre. Debian/Ubuntu users can install something like: default-jre. To build the project yourself install Netbeans. Netbeans should be available in most current distributions. You should be able to run the .jar files easily without compiling the project.